Natural products are everywhere these days, and I think it’s wonderful! The fact that there are products that work so well and are organic and natural is as good for the environment as it is for us! Below are three new (to me) brands that feel and smell amazing! What are your favorite natural products. Leave a comment and let me know. Maybe I’ll try them next! Key West Aloe Aloethera Intensive Body Moisturizer ($27 for 16oz) — Rich and creamy, natural shea and cocoa butters give lasting moisture and hydration. Infused with sunflower, avocado, and coconut oils to replenish thirsty skin. What I think: This is a fantastic smelling moisturizer that heals and moisturizes dry skin. It is intensive, but it sinks right into the skin and isn’t heavy or greasy. It is perfect for heals, elbows and other very dry areas of your body. 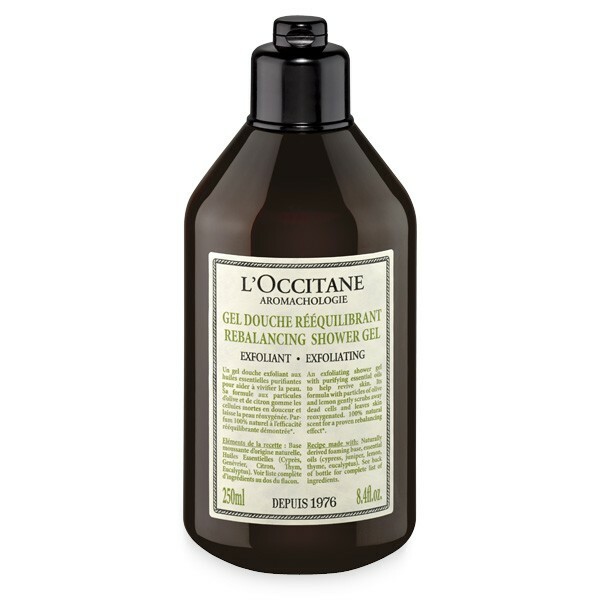 L’Occitane Aromachologie Rebalancing Exfoliating Shower Gel ($20 USD 8.4 fl. oz.) — This exfoliating shower gel, made with purifying essential oils, helps to revive the skin. Its scent is 100% natural. Discover the rebalancing ritual to awaken your senses and bring well-being and harmony to body and mind. What I think: This is a very aromatic shower gel, very herbal. It’s really nice for exfoliating dry skin or getting skin ready for self-tanning. It is important to exfoliate at least once a week. This is a refreshing and natural way to do so. Purity of Elements Nourishing Hand Cream ($15, 3 fl. oz.) — Provides instant soothing comfort and ultra hydration leaving hands feeling delicately scented and silky soft. Performance ingredients; Aloe Vera to soothe, Vitamin E Oil to protect and repair and Licorice Root Extract to brighten and help reduce appearance of dark spots. Performance ingredients include: Aloe Vera to soothe, Monoi and Jojoba Oils drench skin with moisture and re-balance skin. What I think: The scent of these products is called Santa Fe Sun, Ginger Lime and Sunflower. It smells delicious — fruity and bright! It is so good. The body wash is very creamy and hydrating. I follow it up with the body lotion which is moisturizing without being greasy. And the hand cream is light and perfect to carry in my purse. Plus it is so good for the skin! miniOrganics Enriched Moisturizer ($49 USD) — This luxurious moisturizer is essential for nourishing, conditioning and supporting the skin during pregnancy, leaving it wonderfully hydrated, incredibly soft and supple. A perfect blend of the finest certified organic butters and anti-oxidant rich oils infused with miniOrganic’s unique blend of essential oils, all chosen for their regenerative, healing and restorative properties to help promote elasticity, keep pregnant skin soft and supple and assist in the reduction in the appearance of stretch marks. miniOrganics Nourishing Body Oil ($49 USD) — A unique blend of Certified Organic, antioxidant-rich camellia tea, avocado, jojoba and rosehip oils combined with an infusion of safe essential oils, all known for their soothing, rejuvenating and restorative properties. This oil promotes elasticity and keeps pregnant skin soft and supple. It may also help reduce the appearance of stretch marks. miniOrganics Infant Moisturizer ($26 USD) — The perfect all-purpose, all-natural, gentle moisturizer that helps soothe, hydrate and protect delicate young skin. A super-light, non-greasy formulation, rich in certified organic oils and infused with soothing organic lavender and calming chamomile makes it ideal for babies, young children and anyone with sensitive skin. What I think: This organic body care line has products that are perfect for mom and baby. My babies are older now, but I think this line is for women of all ages. The oil smells amazing and is so hydrating. The moisturizers are both very gentle and softly scented. I love that since it is a brand that makes products safe for babies, I’m confident on how good it is for my skin.